Dream Homes of Cabo, has announced the deal of Villa Lands End, for US$5,900,000 USD. It’s a property like no other. SHERMAN OAKS, CA, UNITED STATES, September 13, 2018 /EINPresswire.com/ — "Like fine caviar, Villa Lands End was constructed to be enjoyed by groups and families that have a taste for life's more refined selections. Over the past year, it has appealed to the likes of Hollywood A-listers, Pro Athletes, Victoria Secret Supermodels and well-known US radio and TV-personalities. If you enjoy Rothschild, Bugatti and Canados, then you will love Villa Lands End,” said Amanda Westmoreland, Villa Lands End’s spokesperson and Press Representative. Described as an opulent, luxurious, modern, and architectural masterpiece, Villa Lands End is more suited for the avid traveller who believes they've seen it all. With respect to location, view and high-end finishes, there is no comparison to this modern Mexican rendition that was designed by architect Cesar Leon. Located within the upscale, gated community of Pedregal, which is sometimes referred to as the “Beverly Hills of Cabo,” Villa Lands End contains every feature that a discerning taste requires. The villa comes complete with a Gourmet Kitchen, separate prep-kitchen, formal dining room, multiple fire features, central air conditioning, nine smart televisions with satellite service, indoor/outdoor stereo system with satellite radio + iPod connections, lightning fast wifi and a multitude of high-end design elements throughout. 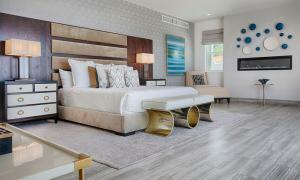 Remodelled less than 2-years ago from floor-to-ceiling, Villa Lands End is sophisticated and spectacular. It is perched 260-feet above the Pacific Ocean, with a stunning rock-cliff vantage point that offers magnificent north and south views. The state-of-the-art villa also amalgamates strikingly superb design, sprawling terraces, a negative-edge swimming pool and an eight-person jacuzzi. The modern and spacious living areas boast ample room for families to relax in impeccable comfort and style. According to Amanda, Villa Lands End is often likened to the "Tony Stark Compound of Cabo,” thus rendering it a perfect fit for the Silicon Valley Executive who needs a little more sea breeze in their life. “Other than a tech-exec, I think this villa is a logical choice for a traveling family who has the perfect mountain home and is looking for a beach oasis to compliment," states Amanda. Villa Lands End presents a fantastic opportunity for people interested in Mexico home-ownership, between the ages of 35 and 65 and are in the market for a luxurious property in Cabo. “We cap it at 65 because the home does have a few stairs,” noted Amanda when making reference to the various floors that cascade down the cliffside, towards the ocean. As an added benefit—for those that are willing to share their dwelling with the rest of the upper-eschelon–the property has the ability to provide great rental income when looking at foreign investment opportunities. Leading the Dream Homes Sale’s team are Mishan Andre and Danette Reid. Both Real Estate Advisors are CONOCER CERTIFIED (Mexico’s national governing body of Real Estate professionals) and bring years of experience and top-level negotiation. As experts in providing resources designed to help close title and provide new home move-in services, Mishan and Danette specialize in Pedregal real estate and the surrounding areas. Their primary goal is to help clients understand the value, future development, infrastructure and ROI projections as it relates to their investments in Mexican real estate. With more than $25 million in transaction volume this year, the Mishan and Danette team is proud of the quality service they have been able to provide their clients. “When looking for modern oceanfront luxury, there is no comparison to this home,” says Paul Geisler, Broker of Dream Homes of Cabo. Aware of the other marketing offerings, Mr Geisler knows as he too is a current Cabo beachfront Homeowner. 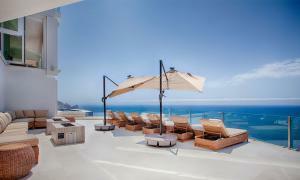 Villa Lands End, as Amanda has noted, has not only been reborn, but is renewed, refined, and transformed into the most spectacular modern villa on the Pedregal cliffs.